Talking point of the day was the cliff fall on the west side of Middle near to the south end. 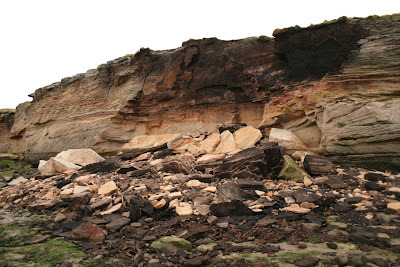 Some massive slabs and other rock debris bore witness to the substantial nature of the collapse which involved a fair length of the cliff. No doubt the recent frost assisted the inevitable. 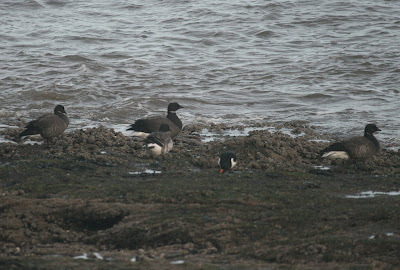 Three dark-bellied Brent (right) (out a total of 136) were an increase on sightings during the last two weeks and therefore some are probably new arrivals. The blue and red Dublin ringed bird was again seen in the flock with the pales. 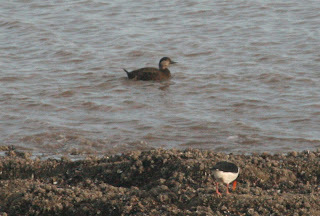 Very quiet on the sea, just a single Red-throated Diver, a Shag, a Great-crested Grebe and male and female Common Scoters (left). A large count of 752 Cormorants flew out at dawn and 180 Shelduck were south of the islands, while counts of waders as usual were difficult at low tide but 15 Purple Sandpipers and 11 Grey plovers were of note. Not much change on the ground, 5 Song Thrushes, 2 Blackbirds, a Dunnock, 2 Meadow Pipits and 3 each of Robins and Wrens. A Rock Pipit at the north end that had been previously ringed was new in today. Both Peregrine and Kestrel were around at some stage.